Today I want to take a look at a very important topic in regards to the Pokemon TCG and that is money. I think the costs of cards has a lot greater effect on how the strength of the meta game develops than most players would think. Are the rich like Giovanni and Mitt Romney more advantaged in the Pokemon TCG? Recently, a lot of players have been complaining about how the spread of information on the internet in regards to Pokemon TCG had made tournaments this season much tougher than in past years, as more players have access to better lists, which increases the level of competition. I think there is probably some truth to this, but I don’t think this has had as much impact on the level of tournament competition as people may think. After playing the game for awhile now, it has become clear to me that once some solid fundamentals in the game has been grasped, it isn’t all too difficult to be able to put together solid lists from the get go. If I have been able to come to this point of Pokemon Enlightenment in such a short time playing the game, then it would be illogical to think that most other players in the game don’t also achieve this after playing the game for a little bit, or with the help of other players who have been playing for awhile. In addition, at least as long as I have been playing, access to solid lists have always been available via premium sources, such as Six Prizes Underground. So if all this information has already been available, then what has changed as of late that has led to tournaments becoming so much more difficult than they were last Spring? One thing – the money it takes to play this game competitively. For Fall Battle Roads, there were only two rich man’s cards in the game, Rayquaza DRX and Tropical Beach, the latter of which saw little competitive play in the Fall format. For Fall Regionals, the number of these cards was cut in half with the release of Dragon Vault which had an easy to pull Rayquaza, as well as making a promo version of Rayquaza one of the blister pack toppers. So in the Fall, with the release of Mewtwo EX, Darkrai EX, Rayquaza EX, and later Rayquaza DRX as promos, we ended up with a format where non of the cards needed for the top decks (or any decks for that matter, save Quad Tropical Beach.dek) had any really expensive cards in them. This made for a very affordable format that was accessible for all players to play in at a high level. Now let’s take a step back and look at the tournaments we had last year. During City Championships, I felt that Chandy Beach (Chandelure NVI/Dodrio UD/Vileplume UD) was the clear cut best deck of the format. If you were playing this deck, I feel you had a strong probability of winning the tournament over other players who weren’t playing the deck, it was that good. What made this deck so special? 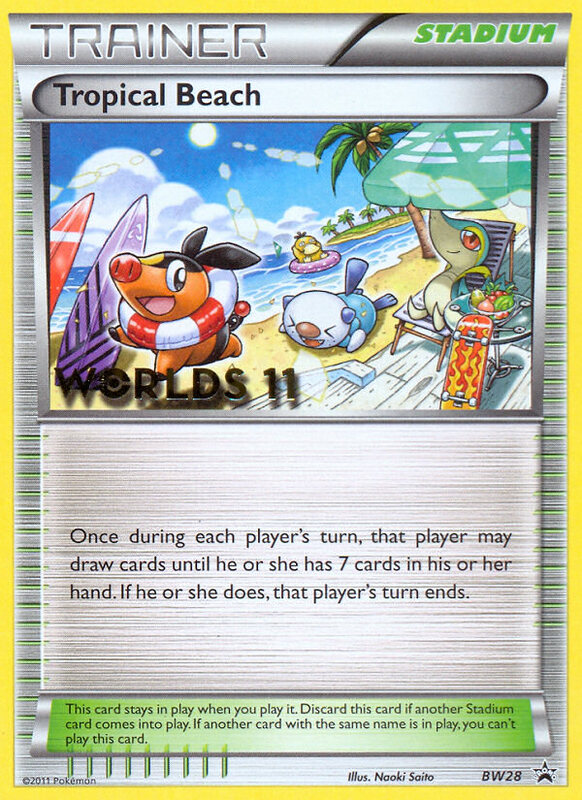 It was deck enjoyed by an exclusive class of players who had access to Tropical Beach, the 2011 and 2012 World’s Promo Card. A proper Chandelure build would play at least 2 of these cards, with some builds playing 3 or 4 copies. At this time, Tropical Beach was largely a $90+ card, which means depending on your Tropical Beach count, you could be paying anywhere from $180 to $360, just for one set of cards in your deck. Most players were unwilling to spend this much money on a card, so when this happens, there is a clear competitive advantage for those players who are willing to spend the money on this card to build their decks. Moving forward to the States Format, Mewtwo EX came into the mix. Outside of Durant, all of the top decks (CMT and Zekrom/Eelektrik) needed Mewtwo EX to do well, and even then, a Durant deck saw some success with Mewtwo EX as a tech card. As we found out as the format went on, the more Mewtwo EX the better. At this time, Mewtwo EX was a $60-70 card, so once again you have a situation where optimal lists would want to play 3-4 copies of the card, which quickly adds up to hundreds of dollars, all for one card. A lot of players weren’t willing to spend the money on Mewtwo EX to play it in high numbers, so a weird format developed in which you had some players playing very high Mewtwo EX counts and seeing good success, some players playing lower Mewtwo EX counts with the 1-2 Mewtwo EX that they managed to pull from packs or borrow or whatever, and some players being largely non-competitive by not playing Mewtwo EX. Once again, we had a format develop in which the players who were willing to spend more money on Mewtwo EX’s being at an advantage over those who were unwilling to pay the price for Mewtwo EX. 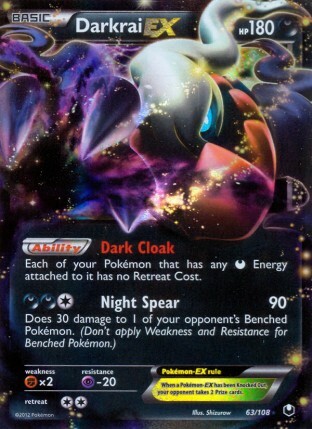 During Spring Battle Roads and the lead up to National Championships, we saw the release of Darkrai EX, another $50-60 card and another card which a lot of players were unwilling to pay the price to buy. 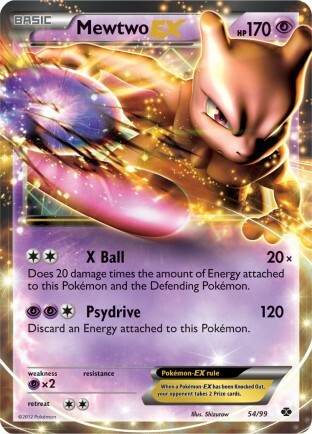 This card was a key player in so many of the best decks in the format, from a variety of Darkrai based decks to Klinklang, Mew/Accelgor, Mismagius/Vileplume, and even a resurgence of The Truth during Battle Roads. At Battle Roads in the Spring, if you were playing a Darkrai based deck in a field of other people who were choosing not to (and the field wasn’t all anti-Darkrai hate decks), you could often find yourself with a competitive advantage for winning the tournament over other players not playing some type of Darkrai infused deck. And that takes us to this past Fall’s Format, in which the old two money EX’s – Mewtwo EX and Darkrai EX were put in tins, along with Rayquaza EX, which was pre-emptively cut off from ever becoming a money EX. In this format, we saw players now being able to play whatever deck they wanted to play as the cost barrier had been removed, and this served to strengthen the meta and as a result made tournaments more difficult to do well in than they were last year. Why is this important right now? Because we may be entering into another one of these types of formats with the release of Landorus EX and Keldeo EX, which will definitely be our most expensive EX cards to be released since Darkrai EX and Mewtwo EX. Both of these cards have the potential to be format defining cards that shape some of the top decks, which will obviously lead to them coming with a high price tag. As of writing this, the cost of Keldeo EX on Troll and Toad is $35 for the regular version and $45 for the Full Art. 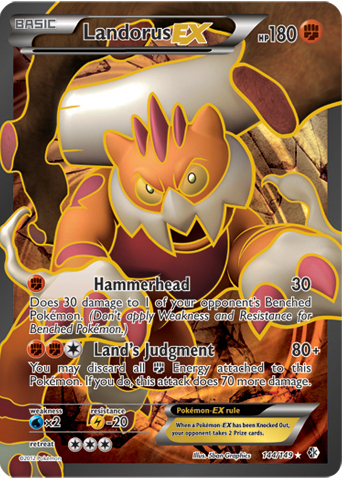 The price of Landorus EX is $45 for the regular version and $55 for the Full Art. Once tournaments start being played, if these cards live up to the hype, their prices will likely increase by $5-10 more. While these cards probably won’t reach anything close to Mewtwo EX levels, they will still be quite high, and are high enough that as proven in the past, a lot of players may just skip out on buying them and choose other decks. If this type of situation happens, in which players bypass buying Keldeo EX and Landorus EX because they are too expensive, the meta game will move towards Hydreigon/Darkrai and Rayquaza/Eelektrik being two of the most played decks. This would lead to decks that can do well against those two decks as having a competitive advantage towards winning tournaments, and Landorus EX decks should theoretically have a good matchup against both of these decks. If this type of situation occurs, that will only increase the price of Landorus EX putting it more out of the price range of those who aren’t looking to spend seriously on the game. Players would in turn move towards Keldeo EX based decks to counter Landorus EX, which would increase the price of Keldeo EX, putting that more out of the price range of a lot of players in this game. If this type of situation occurs, we will be right back at the situation we were at last season where the players that have the cards (Landorus EX and Keldeo EX) will be at a significant advantage over players who don’t have the cards. If Landorus EX and Keldeo EX can live up to the hype, than I would expect a divide to re-develop in this game in which there is a group of players who have the cards who are at a distinct competitive advantage, and then a group of players without the necessary cards to compete, making tournaments easier to compete in than they were during Fall Battle Roads. Don’t drive the hype; prerelease prices for the last four sets have been very high. Just because Darkrai EX opened low doesn’t mean Landorus and Keldeo, which are much more obvious bombs, are going to go up. When supply increases, with the pull rates in this set I expect if they’re staples they’ll drop by 10, if they’re less than 3-ofs in tier 1 they’ll drop by 15-20. Most of the time this is how prerelease prices have worked, and having been playing and dealing since base set…this is a pretty normal trend. Don’t say the sky is falling, people will start buying hardhats. I agree that Keldeo and Landorus are getting plenty of hype, but at the same time people need to find really effective uses for them in order to justify spending for singles. I have a habit of buying boxes and hoping for good pulls, meaning that I don’t usually buy singles. Fortunately, none of the current meta’s prices approach those of LuxChomp. At the end of its 2009-2011 run, both Luxray Lv.X and Uxie Lv. X cost above $75 each, and pre-made LuxChomp decks sold on EBay for $350-$400. I hope we never have that again. Yeah, I hope we never enter that type of territory again. The game is already expensive as is, I’m not sure I would be ready to start paying giant prices for cards. Luckily it seems as though TPCI has been doing a good job of late at keeping down card prices with promo prints and such, and I don’t expect that to change,a s it seems like the products with the playable promo cards move off store shelves pretty fast.